THE AMERICAN poet and journalist Eugene Jolas, who was born in 1894 to Franco-German parents, published the artistic and literary magazine transition predominately in Paris between the years 1927 and 1938. The last great American-exile periodical printed in Europe before World War II, transition is also one of the most important magazines of its generation. In the wake of the avant-garde modernists from the 1910s and early 1920s, it created a lesser-known yet seminal modernist current that spawned a coherent yet wide-ranging Anglo-American surrealist avant-garde.1↤ 1. See Céline Mansanti, La revue transition (1927-1938), le modernisme historique en devenir (Rennes: Presses Universitaires de Rennes, 2009). For eleven years—an unusual amount of time for a little magazine—transition reproduced the works of the major artists of the time and published the greatest international writers. James Joyce, whose Finnegans Wake appeared in installments as “Work in Progress,” became its main figure. The magazine also featured numerous pieces by Gertrude Stein, early texts by Samuel Beckett and Dylan Thomas, as well as parts of The Bridge by Hart Crane, and it introduced works by Franz Kafka (including the first English translation of The Metamorphosis), Saint-John Perse, Hugo Ball, Henri Michaux, Rafael Alberti, Alfred Döblin, C. G. Jung, Kurt Schwitters, and many others to an Anglophone audience. Such prestigious writers and artists as Hans Arp, Gottfried Benn, Kay Boyle, Constantin Brancusi, Georges Braque, André Breton, Robert Desnos, Marcel Duchamp, Carl Einstein, Paul Eluard, Alberto Giacometti, André Gide, H. D., Ernest Hemingway, Paul Klee, Valery Larbaud, Michel Leiris, Henri Matisse, Henry Miller, Anaïs Nin, Francis Picabia, Pablo Picasso, Katherine Anne Porter, Raymond Queneau, Laura Riding, Philippe Soupault, Tristan Tzara, William Carlos Williams, and Louis Zukofsky can be found among its contributors. In this light, William Blake’s presence in transition is surprising on more than one count. First, transition was mainly concerned with the French, American, and German cultures, and published few British or even Irish writers. Second, this magazine, like many others of the period, promoted unknown or little-known contemporary artists and writers. Therefore, the publication of Novalis, Schelling, Jean Paul, Saint John of the Cross, and Saint Teresa of Avila can be considered as exceptional. Blake appears in transition as the sole representative of the British literary past. The magazine quotes a fragment of his correspondence and also features him in an essay. Moreover, his Proverbs of Hell play a major role in the famous June 1929 “Revolution of the Word” manifesto; indeed, as we will see, the manifesto appears as a dialogue between its authors and the poet. Therefore, the presence of Blake within the pages of transition and the emphasis placed on his work invite us to contemplate the reasons why the author of The Marriage of Heaven and Hell finds a particular place in the magazine as well as in the broader cultural context of 1920s and 1930s France. Interestingly, the Blake revival which takes place in France at the time is based on serious misconceptions of the poet that a close reading of transition reveals. Two months later, Marcel Brion (1895-1984), the young French writer, critic, historian, and art expert, pays homage to the poet on the hundredth anniversary of his death. Brion’s article, simply entitled “William Blake Today,” is inspired by a larger study partially published in September 1925 in the magazine Le Navire d’argent. Other references to Blake will follow. After placing the poet at the center of the “Revolution of the Word” manifesto, transition publishes an excerpt from his famous letter of 1803 to Thomas Butts in its July 1935 issue: ↤ 2. Letter of 25 April 1803 (see David V. Erdman, ed., The Complete Poetry and Prose of William Blake, newly rev. ed. [New York: Anchor-Random House, 1988] 728-29). The extract is published without citation in transition 23 (July 1935): 44.
begin page 53 | ↑ back to top Placed at the head of a section entitled “Little Mantic Almageste,” in which Jolas presents the reader with a “little selection of gnostic, mystic and romantic texts,” this excerpt precedes a series of eclectic quotations from Saint John of the Cross to Bergson, with references to Lao Tzu, Søren Kierkegaard, Justinus Kerner, Jacob Boehme, Dionysius Areopagita, Emerson, Schelling, Pascal, Novalis, Plotinus, C. G. Jung, Saint Teresa of Avila, Swedenborg, and others. 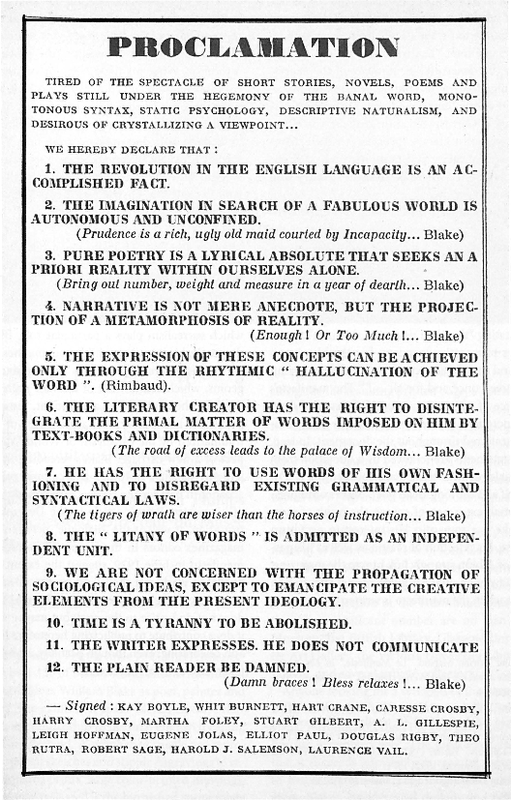 Blake’s testimony on his “immediate” writing practice in his letter to Butts contributes to transition’s development of a conception of the world and of poetry which Jolas calls “vertigralism.” Although “vertigralism” traces its roots back to the first issue of the magazine, it develops more specifically with issue 21 (March 1932), which contains a manifesto, “Poetry is Vertical.” Poetry is defined as a vertical link between a dark, subliminal world (that of the Jungian collective unconscious) and a luminous, transcendental one. The object of “verticalism” (not yet called “vertigralism”) is to encourage men to plunge into their unconscious and then rise up to the mystic heights. Or, to quote Léon-Paul Fargue as Jolas does at the beginning of the manifesto: “We have been too horizontal, I want to be vertical.”3↤ 3. “On a été trop horizontal, j’ai envie d’être vertical” (quoted without citation in “Poetry is Vertical,” t 21: 148). A poet inspired by symbolism and a desire to escape the material world to reach the raptures of the cosmos, Fargue (1876-1947) develops an aesthetic close to the Jolassian quest. From issue 22 on, “verticalism” becomes “vertigralism,” a portmanteau word that combines the vertical dynamics of poetic creation (“verticalism”) with the heroism of a sacred quest pursued by the romantics (“Graal”). The new concept reshapes the content of the magazine through the creation of a column entitled “Vertigral” (issues 23-25), which includes a variety of authors such as romantics (Franz von Baader, Jean Paul, Blake, Novalis, Schelling), expressionists (Franz Werfel, Franz Kafka), a dadaist (Hugo Ball), mystics (Dionysius Areopagita, Saint John of the Cross, Madame Guyon, Saint Teresa of Avila), and neo-romantics (Georges Pelorson, Camille Schuwer). A few years later, in 1938, “vertigralism” leads to the publication of Jolas’s small volume Vertigralist Pamphlet, which mentions Blake again: ↤ 4. Vertigralist Pamphlet (Paris: Transition Press, 1938) 8-9. The mystics used numerous geometrical or architectonic metaphors to express the will to “ascent”, “elevation”, “levitation”, “angelic flight” etc. The desert saint, Joannes Climacus (the name alone is a program!) and his book: Scala Paradisi. The entire gnostic movement with its liturgy of the celestial ladder. The Spanish mystics, especially St. John of the Cross, and his Ascent of Mt. Carmel. Flemish and Rhenish mystics such as Ruysbroeck, Master Eckhart, Tauler, the Strasbourg Friends of God, etc. Blake’s work thus contributes to the creation of “vertigralism,” but, more importantly, it inspires transition’s entire neo-romantic focus. When he assesses “Ten Years [of] Transition” in the Franco-American art magazine Plastique, which was published in Paris in 1938 and 1939, Jolas states: “This pan-romanticism [the atmosphere in which the magazine was born] has remained the principal line followed by Transition during its decade of activity.”5↤ 5. “Ten Years Transition,” Plastique 3 (spring 1938): 23. Then he writes in his autobiography: “I wanted to encourage the creation of a modern romanticism, a pan-romantic movement in literature and the arts.”6↤ 6. Man from Babel, ed. Andreas Kramer and Rainer Rumold (New Haven: Yale University Press, 1998) 93. Indeed, most of the literary texts published in transition reveal a neo-romantic aesthetic whose outline eventually proves to be rather vague (as Jolas’s mysterious “pan-romanticism” suggests), but which is nonetheless characterized by a desire to express the “self” and to set the imagination free. As we have seen, transition pays homage to Blake, but also salutes German romanticism and pre-romanticism (Hölderlin, Novalis, Jean Paul, and von Baader are published, while a debate is devoted to Goethe on the hundredth anniversary of his death in 1932). Moreover, contemporary writers, who acknowledge their debt to Blake and other romantic predecessors, contribute to the magazine’s neo-romanticism. Thus, as Jean-Michel Rabaté writes, Joyce develops an ambivalent relationship to romanticism and shows his interest and fascination with occultism, theosophy, and Blake’s visionary powers.7↤ 7. James Joyce and the Politics of Egoism (Cambridge: Cambridge University Press, 2001) 81. Blake is also a central reference for Hart Crane, another major contributor to transition, whose aesthetic principles are very close to those of the magazine; Crane’s correspondence and poetry such as White Buildings and The Bridge often mention Blake. The magazine’s promotion of French surrealism, the major European avant-garde of the time and one that explicitly acknowledges its continuity with romanticism,8↤ 8. “... this romanticism of which we agree, historically, to be considered today as the tail ...” (“... ce romantisme dont nous voulons bien, historiquement, passer aujourd’hui pour la queue ...”) (André Breton, Second Manifeste du surréalisme , in Œuvres complètes,[e] ed. Marguerite Bonnet, vol. 1 [Paris: Gallimard, 1988] 803). Two other major European avant-gardes discussed in transition, expressionism and dadaism, also show some continuity with romanticism. also explains begin page 54 | ↑ back to top why Blake features so prominently in transition. With about twenty-five surrealist writers, sixty literary and critical contributions, as well as numerous works of art, transition is the great Anglophone magazine of French surrealism. Of course, transition is not the first English-language magazine to publish surrealist productions. As early as 1921, the Little Review, based in Chicago and run by Margeret Anderson, offers poetry by Aragon and Soupault in French. But transition presents its readers with a quantity and a variety of surrealist texts that no other English-language magazine will be able to match until the beginning of the 1940s and the founding of VVV in New York. Moreover, unlike the selections in the Little Review, almost all the surrealist contributions in transition are translated into English. Surrealism thus holds an exceptional place in Jolas’s magazine. This is evident in transition’s publication of surrealist literature and art as well as in its investigations of the unconscious, and, to a lesser extend, madness. Interestingly, Blake plays a role in the creation of this avant-garde. Even if Blake, unlike other British writers such as Horace Walpole or Ann Radcliffe, is never mentioned by Breton as one of the forerunners of surrealism, there is no question that the visionary, mystic, deeply imaginative, and original English poet does represent an important reference for British and French surrealists alike.9↤ 9. Art critic Herbert Read mentions Blake in his seminal study, Surrealism (ed. Read; New York: Harcourt, 1936). Blake is also mentioned by Peter Quennell in a 1933 article for the New Statesman quoted by Paul C. Ray in The Surrealist Movement in England (Ithaca: Cornell University Press, 1971) 83. These remarks invite us to look beyond transition’s specific framework and to examine the modalities of and reasons for what appears to be a wider Blake revival in 1920s and early 1930s France. The general bibliography published at the end of the catalogue for the Blake exhibition in Paris in 1947 shows that out of twelve “French works” on Blake, five were published before 1920, two in the 1930s and 1940s, and no less than eight in the 1920s. As for the French translations of the poet’s work, seven were available in 1947, six of which were issued between 1923 and 1934. As the bibliography indicates, Blake is little known in France before the 1920s, even among the French cultural and literary intelligentsia. Whereas Blake managed from the 1860s to attract the attention of British poets and critics such as Gilchrist, Rossetti, and Swinburne, it took him more time to find a place in the French literary landscape. Although Joseph Milsand devoted a long essay to him in the Revue moderne in 1868, Blake did not become the center of much attention before the turn of the twentieth century. In 1900, Charles Grolleau was the first to translate a work by Blake, The Marriage of Heaven and Hell. Seven years later, two academic publications presenting the poet and artist appeared: Un maître de l’art: Blake le visionnaire, by François Benoît, and above all Pierre Berger’s doctoral thesis, William Blake, mysticisme et poésie, hailed by French and British critics alike as the best work on Blake ever published, and reprinted in 1936 as a consequence of its success outside the scholarly field. At the same time, a few critical articles started to come out in the literary and cultural magazines of the time. Among Blake’s early French proponents, Henry-David Davray, who was in charge of the English literature column of the Mercure de France, mentioned the poet many times in the 1910s and 1920s. However, Blake did not achieve wide recognition in France before the beginning of the 1920s, and undoubtedly André Gide was instrumental in this Blake revival. In a 1921 letter to Jacques Rivière, the director of La NRF, the main French literary magazine of the time, he wrote of Blake: “It is a shame that in France we still hardly know anything about him.”10↤ 10. “Il est honteux qu’en France on n’en connaisse encore à peu près rien” (letter of 6 January 1921, in Gide and Rivière, Correspondance 1909-1925, ed. Pierre de Gaulmyn and Alain Rivière [Paris: Gallimard, 1998] 629). Blake’s editorial fortunes and misfortunes also caused much ink to flow in the United States, even though his poetry, if only because it was in English, was much better known there than in France. In 1917, John Gould Fletcher wondered in an article written in Poetry for the publication of Frederick E. Pierce’s Selections from the Symbolical Poems of William Blake: “When will the lovers of poetry and the students of Blake be given an adequate and a cheap edition of Vala—Blake’s masterpiece? It is a disgrace to England and to America that nothing of the sort has been attempted.”11↤ 11. “Yale Discovers Blake,” Poetry 9.6 (March 1917): 320 (the pagination is that of the reprint). Gide did not stop at criticizing the situation of Blake’s work in France; he also took action by publishing a complete translation of The Marriage of Heaven and Hell in La NRF in August 1922 (Aveline reissued this translation the following year in volume form).12↤ 12. “Le Mariage du ciel et de l’enfer,” La NRF 19, no. 107 (August 1922): 129-47. The magazine Les Écrits nouveaux simultaneously published in its August-September 1922 issue some Songs of Innocence in French, without indicating the name of the translator. The translator’s introduction is somewhat surprising; indeed, it suggests Gide’s discriminating opinions of Blake’s work. He describes Marriage as “the most significant and the least dense of the ‘prophetic books’ of the great English mystic, who was at the same time a painter and a poet.”13↤ 13. “le plus significatif et le moins touffu des ‘livres prophétiques’ du grand mystique anglais, à la fois peintre et poète” (Gide, William Blake, Le Mariage du ciel et de l’enfer [Paris: Aveline, 1923] 9). Then, he articulates his interest in Blake with great tact: ↤ 14. “Swinburne fut un des premiers à en signaler l’importance. Rien n’était plus aisé que d’y cueillir les quelques phrases pour l’amour desquelles je décidai de la traduire. Quelques attentifs sauront peut-être les découvrir sous l’abondante frondaison qui les protège. —Mais pourquoi donner le livre en entier? —Parce que je n’aime pas les fleurs sans tige” (Gide, William Blake, Le Mariage du ciel et de l’enfer 10). Swinburne was one of the first to point out its [Marriage’s] importance. Nothing was easier than picking the few sentences for the love of which I decided to translate it. Those careful enough may be able to discover them under the luxuriant foliage that protects them. begin page 55 | ↑ back to top —But why give the entire book? Gide does not reveal the circumstances of his encounter or re-encounter with Blake in the introduction to his translation, but he offers some indication in the 1947 Blake exhibition catalogue: “The Blake star twinkles in that remote region of the sky where the Lautréamont star also shines.”15↤ 15. “L’astre Blake étincelle dans cette reculée région du ciel où brille aussi l’astre Lautréamont” (William Blake, 1757-1827 [catalogue of the exhibition organized by the British Council and the Galerie René Drouin] [Paris, 1947] n. pag.). Interestingly, like Jolas in his October 1927 editorial “Enter the Imagination,” Gide seems to reach Blake via another poète maudit who then held a considerable place in France, Lautréamont. Lautréamont, who died unheralded in 1870 at the age of twenty-four, is the author of a single masterpiece, The Lay of Maldoror (Les Chants de Maldoror), published in 1869. Discovered in 1917 by Soupault, The Lay of Maldoror greatly influenced the surrealists, who were as attracted to the work’s extraordinary violence and poetic originality as they were to the mystery surrounding Lautréamont’s life and character. The parallel between Lautréamont and Blake that Gide suggests clarifies the reasons for renewed interest in the British poet in a literary milieu that is heavily marked by surrealism and, more generally, by a certain neo-romanticism. In fact, the predominant areas where the French Blake revival in the 1920s and 1930s took place were also the sites which promoted surrealism and a neo-romantic aesthetic. One of Blake’s most passionate defenders at the end of the 1920s in France in Soupault, the coauthor, with André Breton, of The Magnetic Fields (Les Champs magnétiques), the founding act of French surrealism in 1919. Soupault translated Songs of Innocence and of Experience with his wife, Marie-Louise, in 1927.16↤ 16. Chants d’innocence et d’expérience (Paris: Les Cahiers libres, 1927). An extract from this translation is published by La NRF 26, no. 152 (May 1926): 537-42. A year later, he published William Blake, a biography distributed by the Parisian Rieder Press and reissued the same year in English by London publisher John Lane. The biography characterizes Blake as an exceptional being (he was not “a being of this world”17↤ 17. Soupault, William Blake, trans. J. Lewis May (London: John Lane, 1928) 10. Soupault would also write an introduction to the catalogue of the 1947 Blake exhibition in Paris. ), an idealist and solitary genius whose life and work cannot be separated. It is striking that Soupault repeatedly makes reference to Blake’s “simplicity,” “purity,” and “childishness”: as he claims in his conclusion, the man who “preferred the company of children”18↤ 18. Soupault, William Blake 58. and created “the stuff that dreams are made on, noble yet childlike”19↤ 19. Soupault, William Blake 58. developed an art both “simple” and “pure.” And, as he concludes, Blake’s poetry is “all the more difficult because at first sight his work seems to suggest the quality of gentle, childlike simplicity.”20↤ 20. Soupault, William Blake 60. Writers such as Gide or Soupault were not the only ones responsible for this renewed interest in Blake. A wide range of little magazines open to foreign literatures and willing to promote young contemporary writers as well as underestimated talents from past centuries played a prominent role. The “misunderstood messenger William Blake”21↤ 21. “[le] messager incompris que fut William Blake” (Charles Grolleau, “William Blake, Introduction,” William Blake, Le Mariage du ciel et de l’enfer, tr. Grolleau [Paris: Lucien Chamuel, 1900] 25). thus found his place in Le Navire d’argent, the magazine that the famous bookseller of the rue de l’Odéon, Adrienne Monnier, distributed between June 1925 and May 1926. The fourth issue, published in September 1925, presented Blake in a larger literary landscape. Indeed, in its short life, the magazine drew several panoramas of foreign literature translated into French, starting with English literature in June 1925 and a solid bibliography, “From the Origins to the End of the Renaissance” (“Des origines à la fin de la Renaissance”). “Restoration and Classicism” (“La restauration et le classicisme,” in the July issue), “The Survival of Classicism” (“La survivance du classicisme,” in August), and “Pre-Romanticism and Romanticism 1770-1832” (“Le pré-romantisme et le romantisme,” in the September issue devoted to Blake) follow. The magazine’s coverage over time and the diversity of documents in each issue both contribute to the eclecticism of Le Navire d’argent. Thus, the Blake special issue combines a selection of poems, a portrait of the poet, a previously unreproduced drawing thought at the time to be by the artist, as well as several essays written by prestigious personalities: Arthur Symons, Swinburne, and Brion, who, according to the editors, is the author of “an important and previously unpublished study on William Blake” (“une importante étude inédite sur William Blake”).22↤ 22. Symons is the author of “La Place de William Blake” (“William Blake’s Place”); Swinburne, of “Le Génie et la foi de William Blake” (“William Blake’s Genius and Faith”); Brion, of “Vie de William Blake” (“William Blake’s Life”). But a close look at French magazines of the 1920s and 1930s where Blake is given special attention reveals that such interest does not spring only from a common enthusiasm and curiosity that the little magazines’ editors feel for the misunderstood genius. Indeed, Blake plays a particularly important role in the editorial policy of several neo-romantic magazines developing a specific interest in surrealism. transition is of course one, but we can also mention Les Cahiers du Sud, run from Marseilles by Jean Ballard, and Le Grand Jeu, created in Paris by Roger Gilbert-Lecomte. Although Les Cahiers du Sud was founded in 1921, the magazine only started gaining momentum four years later, when it published almost all the begin page 56 | ↑ back to top surrealists (with the notable exception of Breton) as well as writers influenced by surrealism, such as Michaux and Artaud. Brion, the longtime editor of the foreign literature column, published in February 1926 “Les Livres prophétiques de William Blake” (“The Prophetic Books of William Blake”), a separate fragment from the larger study already partially printed in Le Navire d’argent. In the fragment in Les Cahiers du Sud, Brion discusses Tiriel, The Book of Thel, The Marriage of Heaven and Hell, and Visions of the Daughters of Albion.23↤ 23. “Les Livres prophétiques de William Blake,” Les Cahiers du Sud 76 (February 1926): 108-32. A few years later, in 1935, when the specialist in German romanticism, Albert Béguin, discussed the common origins of surrealism and romanticism in Les Cahiers du Sud, the magazine published several poems by Blake translated into French by Charles Grolleau: “À l’été,” “À l’automne,” “À l’hiver,” “À l’étoile du soir,” “Au matin,” “Chanson,” “Chanson,” “Berceuse.”24↤ 24. Les Cahiers du Sud 174 (July 1935): 521-29. Le Grand Jeu, founded in the summer of 1928 by Gilbert-Lecomte, is another magazine which finds inspiration in surrealism and shares with transition many contributors and a certain lyrical and mystical conception of the world. In the first issue, as he reflects on “the nature and the form of the spirit’s progress towards its liberation,”26↤ 26. “la nature et la forme de cette marche de l’esprit vers sa libération” (Henry, “La Force des renoncements,” Le Grand Jeu 1 [summer 1928]: 12). Maurice Henry sees Blake as one of the leaders of “the rebellious spirit’s progress towards its resorption in unity”27↤ 27. “de l’esprit en révolte vers sa résorbtion [sic] en l’unité” (Henry 14). : “William Blake saw in the primordial night the last of the gods, the creative Madmen, who breathed out the world. They had been vomited by the motionless eternity. Duration was not flowing yet. Endless, hopeless, sweating blood, screaming with fear, they hammered the void.”28↤ 28. “William Blake a vu dans la nuit primordiale les derniers des dieux, les Fous créateurs, qui expiraient les mondes. L’éternité immobile les avait vomis. La durée ne coulait pas encore. Sans fin, sans espoir, suant du sang, hurlant d’angoisse, ils martelaient le vide” (Henry 13-14). The magazine’s metaphysical and even mystical quest is increasingly pronounced. Thus, the chief editor states in the third issue: “Clairvoyance is experimental metaphysics.”29↤ 29. “La Voyance, c’est la métaphysique expérimentale” (Gilbert-Lecomte, “L’Horrible Révélation ... la seule,” Le Grand Jeu 3 [fall 1930]: 16). He clarifies this remark in a footnote: “What darkening of the thought has prevented man from taking into account the nature and universality of the mystical testimonies of Blake’s ‘Prophetic Visions’, Nerval’s Aurélia, Poe’s dialogues, and Rimbaud’s ‘Illuminations’?”30↤ 30. “Quel obscurcissement de la pensée a-t-il empêché l’homme de tenir compte de l’identité et de l’universalité des témoignages mystiques des ‘Visions prophétiques’ de Blake, de l’Aurélia de Nerval, des dialogues de Poe, des ‘Illuminations’ de Rimbaud?” (Gilbert-Lecomte 16n). In the same issue, another surrealist writer, André Delons, refers to the master and eventually quotes a fragment from The Book of Thel (from “Pourquoi l’oreille ne peut-elle être fermée à sa propre destruction?” [“Why cannot the Ear be closed to its own destruction?”] to “Pourquoi un petit rideau de chair sur le lit de nos désirs?” [“Why a little curtain of flesh on the bed of our desire?”]): ↤ 31. “L’individu, naissant à la conscience de soi, s’épouvante devant la volière criarde et rauque de ses propres sens, obstacle inné entre le monde et lui, entre ses désirs et ses prises. La première étape d’une évolution humaine qui, si elle est consciente, ne pourra être que douloureuse, sera la pratique d’une véritable dédifférenciation des sens afin d’abolir leur diversité d’abord, puis de tendre à supprimer leur intermédiaire. Nulle expression de ce tourment et de cette expérience n’est aussi primitive et chargée de symboles immédiats que celle qu’en donne William Blake dans le fragment qui suit” (Delons, “De certains soleils fixes,” Le Grand Jeu 3 [fall 1930]: 36-37). Interestingly, the admiration and even the worship that transition, Les Cahiers du Sud, and Le Grand Jeu show for Blake originate in a metaphysical quest that differentiates those magazines from Breton’s official surrealism, which is characterized in the second half of the 1920s by a dialectic between matter and spirit. Nevertheless, this opposition between official and dissident surrealisms was about to blur. As Robert Kanters writes about Le Grand Jeu: “These unfaithful disciples are in a way forerunners, they are ahead of the master.”32↤ 32. “Ces disciples infidèles sont en un sens des précurseurs, ils devancent le maître” (Kanters, “Ésotérisme et surréalisme,” Mélusine 2 [“Occulte-Occultation”] : 15). See also Dickran Tashjian, A Boatload of Madmen: Surrealism and the American Avant-Garde, 1920-1950 (London: Thames and Hudson, 1995) 26 (in reference to transition). Indeed, Breton’s surrealism evolved. Although in 1928 Breton was mainly concerned with historical materialism in his magazine La Révolution surréaliste, in 1930 he started developing an interest in esoterism and occultism in his new magazine Le Surréalisme au service de la Révolution. But at the end of the 1920s, there was still a deep dividing line between the dissidents and the official surrealist group led by Breton. The fact that some of the surrealist writers showed great interest in Blake, whereas Breton never mentioned the poet, exemplifies this division. Indeed, the metaphysical quest of the dissidents clashed with the materialism of the official group. There were more grounds for conflict. The dissidents reproached the surrealist leader for his authoritarianism, especially after the publication in 1929 of the Second Manifeste du surréalisme. All three magazines also claimed, though to different degrees, a non-political and internationalist stand which separated them from communist sympathies and the predominantly national concerns of the official group. The result both of individual concerns and of larger editorial policies, Blake’s revival in the 1920s and 1930s in France echoes a zeitgeist, so much so that it tends to turn into a trend. A 1929 letter from Saint-Georges de Bouhélier to Léon-Paul Fargue offers evidence of this: “You are the great visionary of our time. William Blake alone can be compared to you. For Rimbaud is less deeply mystical, his hallucinations are of a different nature.”33↤ 33. “Vous êtes le grand visionnaire de notre temps. William Blake seul peut vous être comparé. Car Rimbaud est moins profondément mystique, ses hallucinations sont d’un autre ordre” (letter of 25 February 1929, quoted in Louise Rypko Schub, Léon-Paul Fargue [Geneva: Droz, 1973] 169). Jean Lescure’s testimony on the history of his magazine Messages, published in Paris between 1939 and 1946, allows us better to assess the development of this trend. Reflecting on the history of the first issue of Messages, which was devoted to Blake, Lescure writes in a direct but somewhat exaggerated way: ↤ 34. “On s’intéressait beaucoup aux poètes dont l’œuvre pouvait passer pour présenter un aspect philosophique. William Blake était à la mode. Il ne paraissait pas d’article qui n’y fit référence.L’opérateur proposa donc à Walter Uhl de s’engager plus délibérément dans les voies encore mal explorées de la poésie et de sa réflection philosophique. Et puisqu’on parlait tant de William Blake alors qu’aucun ouvrage de lui ne se trouvait en librairie (où même la traduction de Gide du Mariage du ciel et de l’enfer était rare), l’opérateur se réjouit des explorations auxquelles il allait devoir se livrer, et l’outil des prouesses qu’allait réclamer de lui le premier numéro intitulé William Blake, simplement” (Lescure, Poésie et liberté: Histoire de Messages 1939-1946 [Paris: IMEC, 1998] 26). In spite of his determination to take advantage of Blake’s success in order to launch his magazine, Lescure had to confront two seemingly paradoxical obstacles: first, Blake’s poetry was still unavailable; second, he had trouble finding Blake scholars: ↤ 35. “Il y avait de la facilité dans le choix de l’opérateur. Puisque tout le monde parlait de William Blake, rien ne devait être plus simple que de constituer un beau sommaire. Autre avantage de ce choix, c’est que l’opérateur ne connaissant à peu près personne de la république des Lettres, Blake, connu de tous, l’introduirait partout.Il fallut déchanter. Si tout le monde parlait de Blake, à peu près personne ne l’avait lu. Un peu d’attention aurait dû nous montrer que c’était toujours la même demi-douzaine de phrases qui en étaient citées” (Lescure 27). Despite these obstacles, Lescure did not shrink back: “We had no other choice but getting down to it, reading Blake, translating him and translating a few texts by British writers such as Geoffrey Keynes, Herbert Read and David Friedlander.”36↤ 36. “Il ne nous restait plus qu’à nous y coller nous-mêmes, lire Blake, le traduire et traduire quelques textes d’auteurs anglais, Geoffrey Keynes, Herbert Read et David Friedlander” (Lescure 28). begin page 58 | ↑ back to top The issue eventually appeared with contributions from Lescure, Jean Vagne, Jean Audard, Denis Saurat, Jean Wahl, Geoffrey Stutfield, and Herbert Read. Gide’s complete translation of The Marriage of Heaven and Hell in La NRF, Lescure’s acknowledged use of Blake in Messages, as well as transition’s, Les Cahiers du Sud’s and Le Grand Jeu’s enthusiasm for the poet all point to Blake’s unprecedented fame in 1920s and 1930s France. This renewed interest in Blake is not the result of mere chance: his spiritual and romantic poetry, his metaphysical quest and mystical impulses, the apocalyptic tone of his writings, as well as his image as a visionary and forgotten poète maudit resonate with the programs of many intellectuals, whether French or based in France. Because these avant-gardes did not consider Blake’s poetry and character per se, but in light of their own aspirations, they reinterpreted the poet to the point that they sometimes misunderstood him, as was the case in transition. The interest and enthusiasm for Blake in the pages of transition shows in Brion’s “William Blake Today,” printed in December 1927, and, of course, in the dialogue the magazine offers with the poet in its famous June 1929 “Revolution of the Word” manifesto. Interestingly, both documents reveal a misinterpretation of the poet that sheds light on the meaning of Blake’s rediscovery in 1920s and 1930s France. It is no surprise to find in “William Blake Today” the vision of the poet that already prevailed in Soupault’s texts or in the minds of Les Cahiers du Sud’s editors. Brion’s article, translated into English by editor Robert Sage, invokes “William Blake’s exquisite naïveté and his ingenuousness in the company of men” (t 9: 204), “the sincerity of his heart and the purity of his spirit,” his “genuine poetry,” and “his childish simplicity” (t 9: 205) as many characteristics that make of him a “marvelous child” (t 9: 207), as stated at the end of the excerpt. This analysis highlights purity and sincerity, two values associated with the world of children, natives, and madmen that the French avant-gardes and particularly the surrealists emphasized in their work. However, Brion goes beyond these laudatory remarks. He also proves to be very critical of Blake and more precisely of what he calls Blake’s “awkward philosophy”: “Let us not hesitate to abandon the mortal—and dead—part of the work, the useless emphasis, the prophetic pretensions, this mixture of simplistic evangelism and awkward philosophy” (t 9: 204). The reader soon realizes that Brion does not consider Blake’s work as a whole, but on the contrary sees it as ambivalent, almost as if it had been produced by two different people. On one hand he sees “genuine poetry,” on the other “the darkness of theories badly understood and insufficiently assimilated by a quite uncultured brain” (t 9: 205); on one hand he sees “simply a poet carried away by his desire ...,” on the other “a messiah, a philosopher, a prophet” (t 9: 205), three categories to which Blake mistakenly thought he belonged (“His greatest error was to believe himself a messiah, a philosopher, a prophet ...”). The use of the adverb “simply” is quite relevant: Blake is praised for his simplicity because the critic wants him to “simply” be “a poet carried away by his desire ....” Everything in Blake’s work that does not conform to the criteria of “simplicity” and “purity” by which Brion and others characterize him is discredited as useless, pretentious, awkward, and obscure. Such a reading of Blake’s work is not uncommon. At about the same time, in his review in the Dial of S. Foster Damon’s William Blake: His Philosophy and Symbols, Robert Hillyer mocked the many critics who considered the poet a “half-mad dreamer”: ↤ 37. Hillyer, “William Blake, the Philosopher,” Dial 77 (September 1924): 258). As Hillyer shows, it is in the interest of Blake’s critics to try to disseminate this stereotypical image of the poet, since it allows them the freedom to approximate Blake’s views and to avoid producing a careful study of his aesthetics and philosophy. That is why Hillyer expresses unqualified admiration for Damon’s work: ↤ 38. Hillyer 259. Aware of the difficulty of Blake’s philosophy and determined to clarify its principle, Damon, in Hillyer’s interpretation, seems to anticipate Brion’s criticism and to respond to the peculiar rediscovery of Blake as it occurs across the Atlantic. While Brion’s study revealed a common misunderstanding of Blake in France in the 1920s and 1930s, the famous “Revolution of the Word” manifesto added further evidence that his critics misread Blake. Probably written by Jolas,39↤ 39. This is what Dougald McMillan indicates in transition: The History of a Literary Era 1927-38 (New York: George Braziller, 1976) 48. the manifesto opened transition’s issue 16-17 in June 1929.
begin page 60 | ↑ back to top or vorticists who turned the manifesto into the privileged expression of avant-gardism’s symbolical violence.40↤ 40. See in particular Adrian Marino, “Le Manifeste,” in Les Avant-Gardes littéraires au 20e siècle, ed. Jean Weisgerber, vol. 2 (Budapest: Akadémiai Kiadó, 1986) 825-34. The contents of the proclamation add to this ambivalence. While the manifesto shows a certain continuity with surrealism (even though it also clearly breaks away from it, for example in statement two, or suggests further developments, in statements six and seven), it also builds strong links with literary movements of the past, in particular with romanticism. The third statement is relevant: “Pure poetry is a lyrical absolute that seeks an a priori reality within ourselves alone.” The supremacy of subjectivity is also established in statement ten: “Time is a tyranny to be abolished.” The eleventh statement follows the same line: “The writer expresses. He does not communicate.” By asserting the primacy of the expressive function of language over its communicative one, transition places itself in a long literary and critical tradition, one marked by the work of German romantic Wilhelm von Humboldt and by the symbolist literary theories, of which strong echoes can be found in Valéry and more particularly in his 1928 “Propos sur la poésie,” where he compares poetry with dancing and prose with walking.41↤ 41. See in particular Wilhelm von Humboldt, Gesammelte Schriften, vol. 7 (Berlin: Prussian Academy, 1907) 44, translated and quoted by Tzvetan Todorov, Théories du symbole (Paris: Seuil, 1977) 206, and Paul Valéry, “Propos sur la poésie,” Variété (1928), in Œuvres,[e] ed. Jean Hytier, vol. 1 (Paris: Gallimard, 1992) 1371. The contents of the manifesto thus reveal a certain propensity to continuity already suggested by the very form of the document. The first statement is a case in point: “The revolution in the English language is an accomplished fact.” The authors include themselves in a tradition at the very moment that they proclaim a “revolution.” Although it came as a great shock at the time, the last statement does not suffice to dispel this tension. By stating “the plain reader be damned,” transition certainly uses provocative language, but the idea is not new. In 1914, Pound was already writing in the Egoist: “Damn the man in the street, once and for all ...”42↤ 42. Pound, “Wyndham Lewis,” Egoist 1.12 (15 June 1914): 233. The manifesto’s fundamental choice of continuity is revealed first and foremost by Blake’s quotations, probably suggested by editor Stuart Gilbert43↤ 43. See McMillan 48. and scattered throughout the document. Indeed, six of the twelve statements are followed by a quotation from Blake. A sort of dialogue thus takes place between the text of the manifesto itself and the long-dead poet. Blake’s omnipresence in this essential text is not, of course, the result of mere chance. First, Blake is a romantic. His interest in occultism and the apocalypse, his rejection of reason as well as his passion for the myth of Albion strongly link him to the magazine. Moreover, as we have seen, Blake is given special attention in France at the time when the manifesto is written. All Blake quotations in the manifesto are taken from his Proverbs of Hell. As a genre, the proverb is a form of popular and cautious wisdom. But Blake’s proverbs reverse this essential characteristic to advocate dissension: “The road of excess leads to the palace of Wisdom ...,” “The tigers of wrath are wiser than the horses of instruction ....” Thus, the manifesto’s ambivalence, between revolution and continuity, shows not only in the form and the text of the proclamation, but also in the Blakean subtext. However, the Proverbs of Hell do not coincide with the manifesto; on the contrary, they are its inverted image: whereas the “Revolution of the Word” uses a revolutionary genre (the manifesto) to advocate continuity, Blake uses a conservative form (the proverb) to champion revolution. While highlighting common interests in the power of imagination and contributing to Blake’s institutionalization as an established poet, transition’s use of Blake adds to the magazine’s complex relationship to revolution and continuity and reveals a deep misunderstanding of the poet’s radical spirit. Ultimately, Blake’s ambivalent status as both an intellectual guarantee from the past and a recently discovered poète maudit contributes to the manifesto’s main dialectic between revolution and continuity. Blake’s presence in transition magazine allows us better to understand the modalities of a wider Blake revival in the France of the 1920s and 1930s. The interest of contemporary intellectuals in the English poet mainly derives from the neo-romantic quest of the main European avant-gardes, among which surrealism plays a particular role. Blake’s apocalyptic discourse, his interest in childhood, madness, and the dream, as well as his reputation as a solitary and misunderstood genius, which echoes that of another poète maudit “discovered” by the surrealists, Lautréamont, resonate with the expectations and concerns of a great part of the intelligentsia traumatized by the cataclysm of World War I and the prospect of a new carnage. Blake’s rereading thus takes place in a highly sensitive historical and cultural context, which may account in part for the serious errors made in interpretations of his poetry. Brion’s article in the December 1927 issue of transition, as well as the “dialogue” between the poet and the magazine’s editors in the famous “Revolution of the Word” manifesto in June 1929, suggest the extent of the ignorance of Blake’s work and shed light on the misunderstandings of his poetry. Blake’s rediscovery in the 1920s and 1930s France thus does not do justice to the poet; but maybe more importantly it does contribute to publicizing heretofore little-known work and celebrating, even though partially, a poet who had largely fallen into oblivion at the time.